The privately run team, who already have two championship second place finishes in 2006 and 2008 have been dominant all year on the all-new R1. Riders Steve Martin, Gwen Giabbani and Igor Jerman have been the riders to beat in 2009, taking the first three race victories in a row at Le Mans, Oschersleben and Albacete. 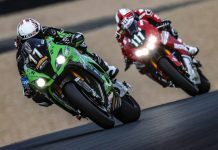 A fourth place finish at Suzuka meant that the three points gained at yesterday’s race in Magny Cours was enough to confirm the win and get the champagne flowing with one more round to go in Qatar in November. "We came here to win, and we’ve done it. We tried to win all the races and for the last one it was not possible but we are very happy to win the title here already. It’s the first title for YART having taken second place twice, so we’ve waited long enough for it. The new Yamaha has proven it’s the best bike in the championship, it’s been incredibly reliable this year and consistently fast at every circuit. I want to say a thank you to the team who worked really hard at each round and to the riders who kept going and racing intelligently to bring home the points. Also a big thank you to all the Yamaha family for the help and support!" "This year was quite tough because we started with a new bike and new tyres, so the full package. Before the season started we had a lot of tests, we worked really hard to set up the bike for Michelin tyres and it worked really well. The season has been great; we’ve had no problems apart from the last race, so we are very happy with the bike. It’s great to have won the title, this was our wish for this year, we tried really hard and we did it. I’m really happy for Mandy and he worked really hard to make a good team and a good bike so deserves this win." "I feel ecstatic for the team, for Yamaha and all our technical partners, I want to say thank you for making my dreams come true. It’s fantastic to win with one race in hand so we can go to Qatar and really enjoy it with the pressure off. Big thanks to my fellow riders as well, it’s been a pleasure racing with them this year." "I feel a bit disappointed about yesterday’s race as we had the speed and everything we needed to win. We have the title though so I feel better! The rest of the year was all perfect, winning at Le Mans to start with was unexpected but the best thing for us, and we knew we were capable of winning the other races from then on. It all ran easy from there, we just missed the podium at Suzuka but we took the points we needed and apart from that it’s been great." In the UK, another successful weekend of racing at Croft saw GSE rider Leon Camier take a 6th and a 1st (his 16th victory of the year) while his team-mate James Ellison took a 2nd and a 4th. The results mean Yamaha have clinched the manufacturer’s title for the British Championship, and as the final two rounds of the British Superbike Championship approach, the last races will decide which of the two Airwaves Yamaha riders will claim the title, another victory for the 2009 R1. There was more celebrating in Germany yesterday as Jorg Teuchert wrapped up the final round of the IDM German Superbike Championship with a second place and a victory. Teuchert had already secured the title by Assen last month having dominated all year on his R1.